ARRA News Service: Cuba Is Latest Benefactor of Obama’s Fairy-Tale Foreign Policy . 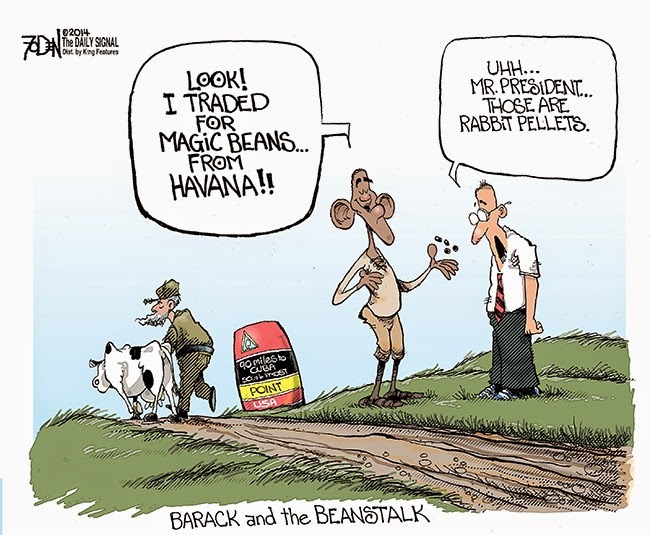 . .
Cuba Is Latest Benefactor of Obama’s Fairy-Tale Foreign Policy . . .
. . . In the his most recent “negotiation” with a foreign nemesis, President Obama has once again given away more and gotten less. Unfortunately for the United States, in the long run, this fairy tale is not likely to have a happy ending. Tags: Cuba, US, President Obama, prisoner trade, editorial cartoon, Glenn Foden To share or post to your site, click on "Post Link". Please mention / link to the ARRA News Service. and "Like" Facebook Page - Thanks!